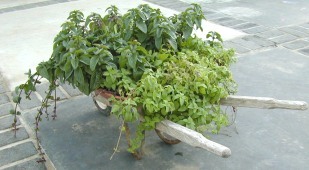 The little wagon shows the lovely chartreuse foliage of the Banana Mint offsetting the dark reddish green of Orange Mint. Like all mints, Banana Mint, should be confined to a pot. Mints grow better in pots with lots of surface area rather than lots of depth. 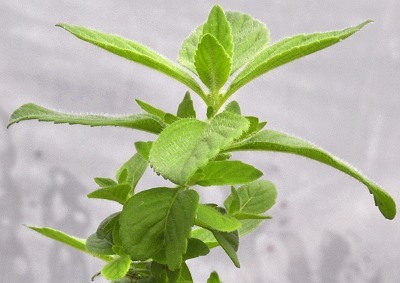 Mint grows so rapidly that it will need to be divided and repotted with fresh soil each spring. To learn more about dividing and repotting mint be sure to visit this page. This really should be a scratch and sniff picture. At first you are not quite sure it is Banana and then it hits your olfactory and, wow, pure Banana!!! This plant is sometimes available in plug trays. These trays hold 128 of all the same plant. They are a great low cost way to fill a lot of space. Each cell is 3/4 of inch by an inch. Check here to see if Banana Mint Plug Trays are available.